The Wild Dolphin Project, a nonprofit scientific research organization studying the behavior and communication of the Atlantic spotted dolphins in the wild, presents their 2nd annual signature event, Wild Ocean Science. This year’s unique event will feature a presentation by National Geographic photographer, Brian Skerry and will be hosted by journalist, Miles O’Brien. 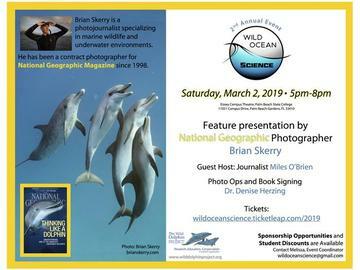 Dr. Denise Herzing, Research Director and Founder of The Wild Dolphin Project, will be signing books and available for photos. SPONSORSHIP opportunities and STUDENT discounts are available. Contact Melissa at 561.575.5660 or email wildoceanscience@gmail.com.